Happy Fresh Veggies Day! How many portions of veg do you eat every day? Five? Seven? Ten? …and, no, potatoes don’t count and neither does wine!!! Nutritionists agree that when it comes to fresh fruit and vegetables, most of us just aren’t getting enough. How about going vegetarian for a day to celebrate this event? (It’s also Fudge Day, but that’s not healthy, so I won’t dwell on it!) I’ve eaten plenty of fruit today, my lunch was a salad with plenty of veg and this evening I ate some delicious home-made veg bhuna. I’d love to hear your favourite vegetarian recipes to celebrate this day. I’m trying really hard, but swimming doesn’t come easily to me. I just hope that it’s good weather on Sunday, and that the sea is calm. I have no idea how sheltered the cove is, but I’ve just looked up the results for all of the events from the last two years and was really surprised to see that only 15-25 people participated in each event… and almost all of them completed it in under 45 minutes. Oh dear – what have I got myself into?! Do you have any tips for sea swimming? Wow! 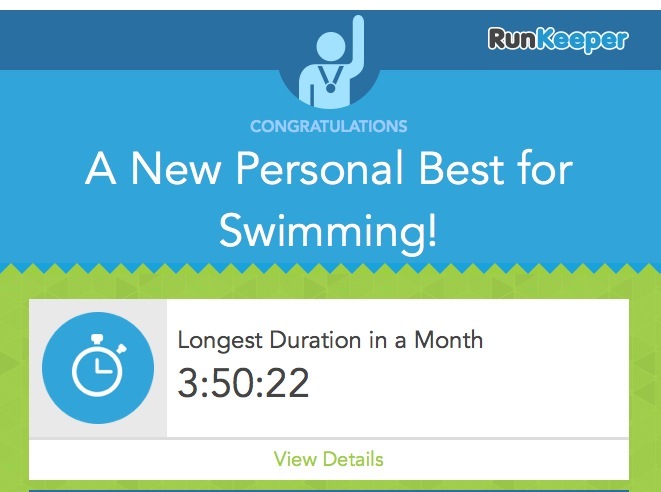 That’s a great swim workout! I’m coming back after a pinched nerve so I’m taking it very easy.. Looking forward to feeling better and doing some workouts. I always feel like someone is waiting for me to get to the end of the lane to talk to me so I have a hard time focusing. I need to work on that and at sighting even when I’m in the pool. I also cut way back on meat this month and just today wrote about how good I’ve felt. I didn’t know today was veggie day!! I will celebrate appropriately. I’m actually having fish tacos tonight but I will load them up with the good stuff! Great post and amazing job!! It’s touch coming back from injury, isn’t it. I have a competitive nature and although I’m aware that there are some people who I swim with that I’ll never beat, I always expect to be able to do as well as I’ve done in the past, which isn’t always helpful. Bizarrely, when I swam without prescription goggles last week, I think I was more focused as I couldn’t see what was going on around me and was less distracted! I definitely have to be mindful of veggies or I don’t eat enough of them. I try to do 3/4 of my plate in vegetables when I’m on good behavior. Your swimming skills amaze me! I would be too afraid to even start, so you are world’s ahead of me! I LOVE veg… which is good as I’m vegetarian. Last night there were some reduced peas in pods in teh supermarket, so they’re going to be my snacks for today! Monday Morning Motivation – How awesome is this lady?